ABOUT THE FOUNDATION: The Together4Tanner Foundation was established after Tanner’s passing in 2014 as a memorial to our beloved son and to positively impact the local community in his name. The Foundation’s purpose is to raise charitable funds for investment in future recreation projects in the city of New Bern and Craven County, NC. The Foundation will also work to raise funds that support academic scholarships for student/athletes in the same area. All proceeds and donations to the Together4Tanner Foundation will be put into action within the local community and to support further fund raising efforts of the Foundation. The Foundation is approved as a 501(c)3 organization per IRS guidelines. The Webb family would like to thank all of you who have supported the efforts of the Foundation and continue to go above and beyond to help us realize our goals of making an impact in Tanner’s name for years to come. ABOUT TANNER WEBB: Tanner is our son who lived 15 amazing years. He came into this world as a miracle when we were told that I may not have the chance to have a child. He was so content to play for hours with his baby gym, or hit the ball off his tee. Tanner had an amazing smile to go along with his bedroom blue eyes. He giggled at everything and really observed how things happened. As everyone knows, baseball was his true passion. However, Tanner was a boy who absolutely adored his family. Family meant everything to him. He was always wanting to know what we were doing as a family, always wanting to visit and talk with family and inviting family over. Not only did Tanner consider relatives family, but he considered friends family too. When he welcomed you into his world, it meant he trusted you enough to be family to him. That is huge for a child. Tanner always trusted people even when he was hurt by them he would always give more chances. Such a beautiful soul and spirit. When Tanner was little, he used to be Mommy and Daddy’s right-hand man! Tanner couldn’t wait to help Dad in the yard and help build the deck or take care of his first puppy. Tanner would also help cook and clean up. When I was pregnant with Andrew and Parker, he knew what he wanted to name the babies. Tanner was so good with his baby brothers. He would let them beat up on him and he never fought back, until he became a teenager! Tanner played baseball since he was a year and a half. He watched baseball on TV and would mimic what they would do. Even spitting and adjusting. Tanner was able to hit a live pitch at 18 months. Baseball was and always will be Tanner. He had his struggles. Tanner was such a small guy and no one thought he could hold his own due to being small. That all changed when he played for the Carolina Stars and his first summer playing for New Bern High School as a Bear. 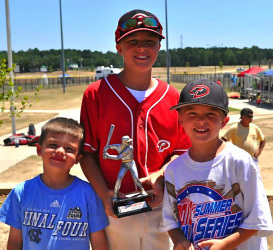 From the moment we moved to North Carolina, Tanner wanted to see where he would be playing baseball in high school. Tanner was finally judged on his ability rather than his size. This is what he had worked for and dreamt of since he was a little boy. Tanner couldn’t wait to be a high school ball player and he knew to do that, he would have to work hard in school. He excelled in school as a student. He did this by taking honors and AP classes and finished his freshman year with a 4.18. His academics were just the avenue he had to take to play baseball. He loved high school and the new found freedom of a teenager. He loved his classes and all the friends he met. He would consider everyone he met and spoke to as a friend. Tanner could get under your skin but in a fun loving and caring way. He always meant well. He may have been naive at times, which as a parent I was grateful for. Tanner left his stamp on this world. For those that met him, and for those hearing of him, Tanner was the kid that was right in this world. He was a great student, a great friend, a great teammate, a great brother and the most amazing son we could ask for. Tanner was chosen to leave this world for reasons we will never know. But, during his short 15 years, he lived a life that most would or could only dream of. He met famous baseball players, coaches and GMs. He hung with rock stars. He traveled and visited ballparks around the country and was able to play baseball on his dream field at Boshimer. All he wanted was ball. Tanner will always be missed. He is a part of our lives and will continue to be. Not a day goes by that we won’t think of him. Until we meet again, sweet boy, we love you.